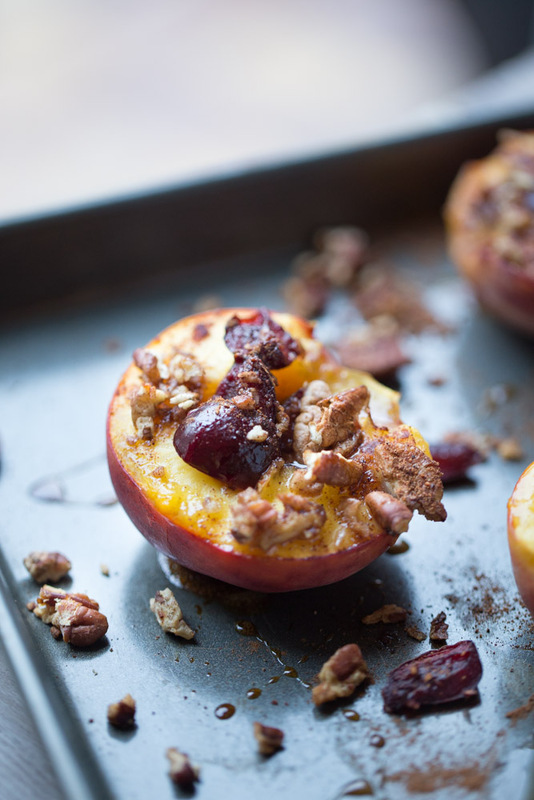 Today we’re talking about these juicy Baked Peaches. They’re baked with sweet cherries, pecans, cinnamon, nutmeg and honey. They’re a great healthier option for dessert, clocking in at under 100 calories per serving! I’m one of those people who prefers most fruits cooked. Strawberries, pineapples, cherries and melons are typically the only fruits I’ll eat raw. Peaches. Nope, I don’t really like to eat them raw. I think it’s because of the texture of the peel. But bake them, grill them or make a cobbler with them and I’ll gobble them up. Lately I’ve been dying to get my hands on some peaches. They aren’t in season here so they are pretty scarce. I did stumble across some a few weeks ago at a produce stand but they were so tiny it was laughable. Last Thursday I was browsing the sales ad for the grocery store and OMG PEACHES. Peaches, listed right there in the produce section of the sales ad! This means the store will have a bin loaded with peaches. The grocery store I shop at strives to keep the shelves stocked with items they have on sale. Hooray for Publix! I bought some peaches on Saturday and then made these baked peaches yesterday. 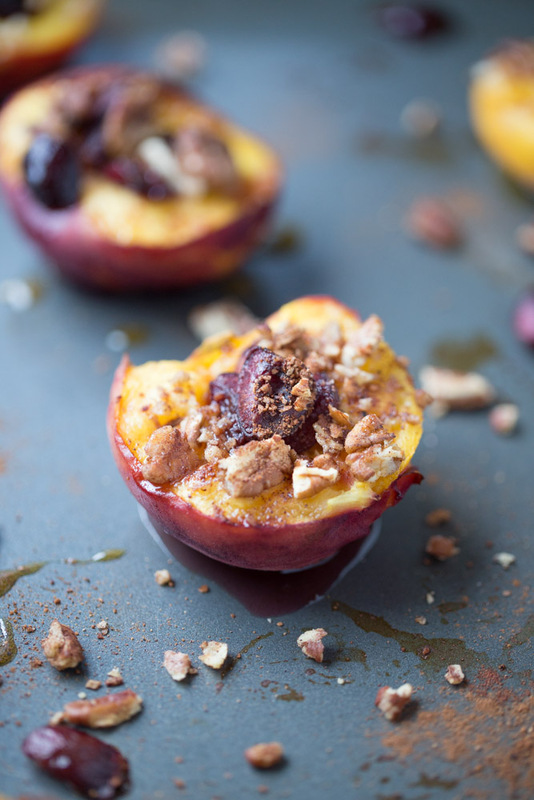 These delicious baked peaches are baked with sweet cherries, pecans, cinnamon and nutmeg and honey. Then they're topped with baked brie cheese. SO good and a healthier option for dessert, too! Under 100 calories per serving. Cut each cherry into four quarters. Combine the pecans, nutmeg and cinnamon. Mix well. Halve each peach and remove the pit. This will be a little tricky because sometimes the peaches don't want to split apart. I cut around the peach and then try to split from the top. Then I remove the pit with either a spoon or a cookie scoop. A melon baller would work, too. Place the peach halves on a large baking sheet, inside facing up. place four cherry quarters in the cavity of the peaches where the pits were. Sprinkle each peach with ½ tbsp of chopped pecan mixture. Then sprinkle each peach with a little more cinnamon and nutmeg. Drizzle each peach with 1 tsp of honey. Bake the peaches for 20 minutes. Once done baking, remove from the oven and cool for a few minutes before serving. Store in an airtight container in your refrigerator for up to 2 days. Julie, these peaches look fantastic! I’ve never had a baked kind before, so I’m loving this version. And topping them with cherries and brie is so creative. Sounds like a great breakfast or dessert! Pinning! 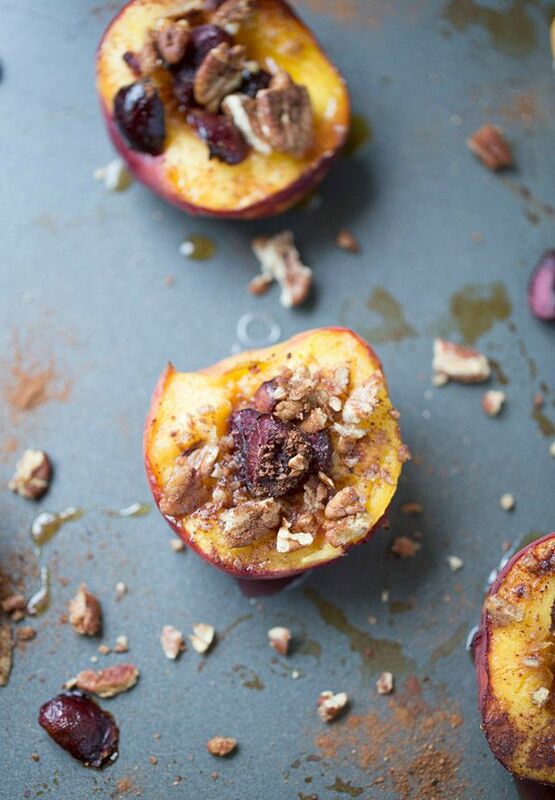 You’ve gotta try baked peaches! They are so good, even solo! Thanks for stopping by and for the pin too, Gayle! I can not get over how crazy simple this is, but yet I know it is jaw-dropping good. Can’t wait to try this combo! Hope you enjoy it, Kristen! Baked brie is probably my favorite food ever. I’m totally craving it now. I haven’t seen peaches yet this year but when I do, I’m totally baking them and covering them in cheese! Yuuuuuum! These look so good! Summer peaches are one of my favorite foods of the year and this looks like a great way to enjoy them. Pinning for future reference! Thanks Lisa! Hope you enjoy the recipe! These peaches are perfection. Pinned! I just adore this recipe. I live in Georgia so as soon as Georgia peaches come out, I have to try this recipe. Brie on peaches, total yumminess! I love baked peaches. I love additions of pecans. Definitely my favorite! Glad you like these, Ilona! The pecans are perfect with these peaches! Wow! Very clever and interesting dessert. I will save this one. Show stopper! I really enjoy brie with sweet toppings (though I have never had it topping a sweet base, sounds delicious), this looks incredible. Of course, Christina! I had two soon after I made them! Wow! These rounds are beautiful and they sound so good – love the flavor combo (and that they’re easy to put together, too)! I was just thinking today how I miss peaches! I don’t think I’ve seen any in our grocery store her lately, too bad for me because this recipes is not only beautiful but full of so many fabulous flavors!! Hi Julie – These peaches will satisfy my sweet tooth. Thanks! So Yummy… I can’t resist myself from making it a try. specially the first one baked peaches with cherries filling.. seems just outstanding.. Thanks so much, Laurence! Hope you give this recipe a try and hope you enjoy it, too! These peaches look gorgeous, Julie! Peach season is my favorite! Love that you baked them with cherries and brie, sounds like such a delicious and healthier treat! Thanks Kelly! I took some to work today and those that tried them LOVED them. They said the brie was a great addition! These and pears – you’re speaking my language. Baking fruit is also pretty great if your fruit friends don’t taste of anything (typical here in Holland). Aww well glad you like these, Francesca! Sometimes the fruit is bland here, too. Right now, strawberries are pretty useless, unless they’re put into smoothies. But in another few weeks, strawberry perfection!